- My favorite, the guest area on the very top floor, painted a dark blue with a smart mix of modern and traditional elements. It has a dark gray flannel chair with Eames era lines flanked by both industrial and Chinese vintage lighting. There is a textured white couch that pops against the dark walls and beautiful oversized contemporary light fixture. The mind behind the room is Greg Lanza Design. - There's a little girl's room that reminded me of the charms of being three feet tall. With a color wash of greens and blues, it's soothing, sweet and sophisticated. The designer, Bartony (bartony7@aol.com), has a charming Texas accent and an equally charming rerelease of old fashioned wallpaper featuring sparrows overhead and lovely white birds tending their young. There are Victorian shoes poking out from under tables. 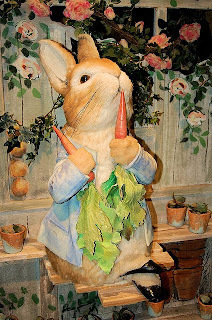 It's a youthful fairy tale with a Beatrix Potter sensibility. - The home's potting shed is not to be missed. With a wall of lush green plants and a trompe l'oeil battered board mat underfoot, it's a green thumb's dream getaway. There is a chair with grasses growing out of the seat and a pretty little greenhouse behind. Brought to you by Robin Horton of Urban Gardens, the space is mossy and elegant. Take a look yourself before it's too late.